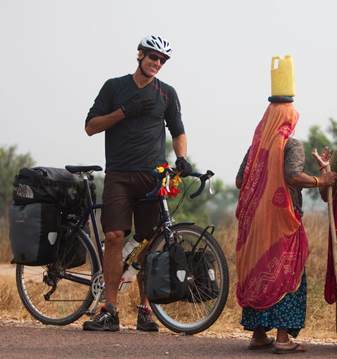 Six years ago Rick Gunn, 49, left his job as a photo journalist to cycle across the world. He eventually met up with Iranian-born cyclist Mohammad Tajeran, who was also cycling the world, and together they crossed Malaysia as a team. Ultimately Gunn and Tajeran were both transformed by scenes of war, poverty, and disease along the way. They each began dedicating their journey to the greater good. “I expanded my definition of what it means to care, to give, and to love,” wrote Gunn, explaining that he volunteered in an AIDS Hospice in Thailand, helped with mine victim rehabilitation in Laos, and simply planted trees in Borneo. Now, the two are planning to reunite next month to ride their bikes across Iran in a symbolic gesture of peace. Their project, Wheels of Peace, will begin with each of them visiting schools in his respective country and sharing his experiences of finding friendship with someone who might otherwise be considered an enemy. The children will be asked to write letters to students in the other country.